Looking for more in your wooden floor maintenance? Our service for floor sanding in Crystal Palace SE19 is the perfect solution for keeping your floors looking like new. Even though wood is a durable material with an easy upkeep, stains, scratches, age and the constant traffic of people and objects wears down the material to the point a simple clean-up doesn’t help anymore. Solve your floor situation with one simple call that turns back time on your wooden floor no matter what specific wood it’s made of. Repair and Restoration: Loose boards. damaged boards that need replacement, etc. This is the first step we take for each and every floor that needs repair. Gap Filling: We use two methods to fill the gaps – putting wood slivers or spreading a special mixture of sawdust over the flooring. Floor Sanding: We strip the old seal and finish that needs to be replaced. Staining: We can change the hue of your wooden floors (Optional). Finish: We use lacquer, oil or wax to finish your floors. After that, they are ready to use! Trust in our BONA-certified technicians to restore your wooden floor to its former glory. 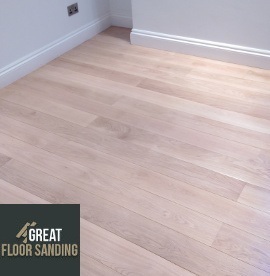 We work at floor sanding in Crystal Palace with skill and precision to ensure your flooring is perfectly even and the wood lasts for years ahead. Each session is carried out with the latest BONA equipment, which promises a quick result and spares you the nuisance of sawdust. Once done, you can freely return and resume your life with ease. Your Wood Floor Sanding is One Phone Call Away! It’s easy to request an expert wood floor sanding team to your property. All you have to do is dial 020 3404 9697 to get in touch with one of our representatives and schedules in a no-obligation viewing. Contact us at any time from Monday to Sunday even on holidays to receive further details on your requested service, edit the details of your viewing or inquire about special discounts. We’ve also got a chat facility and contact form right here on our website.